Bumble bees foraging on almond blossoms. 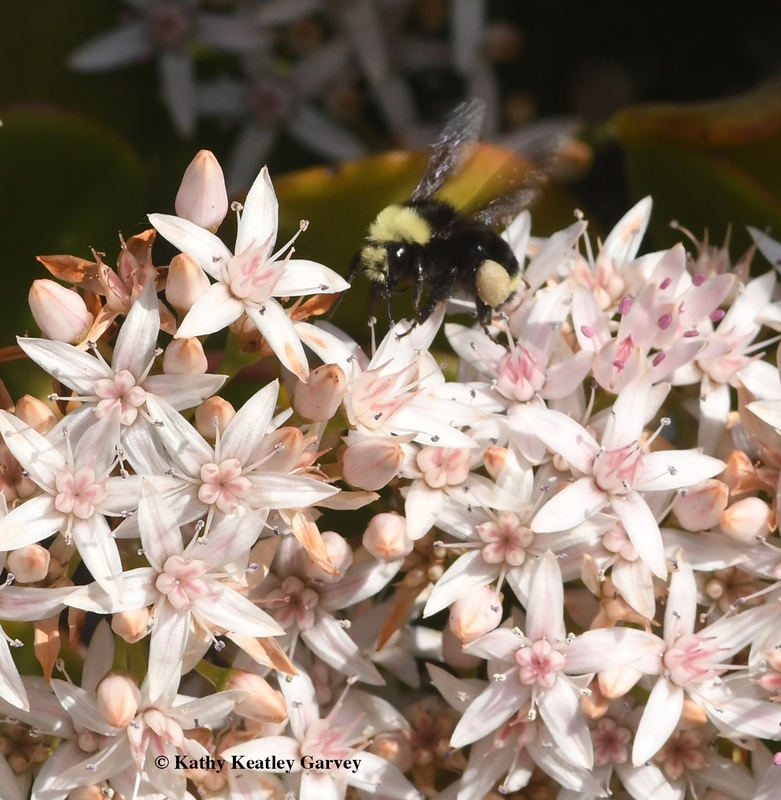 Make that the yellow-faced bumble bees, Bombus vosnesenskii, in Benicia. 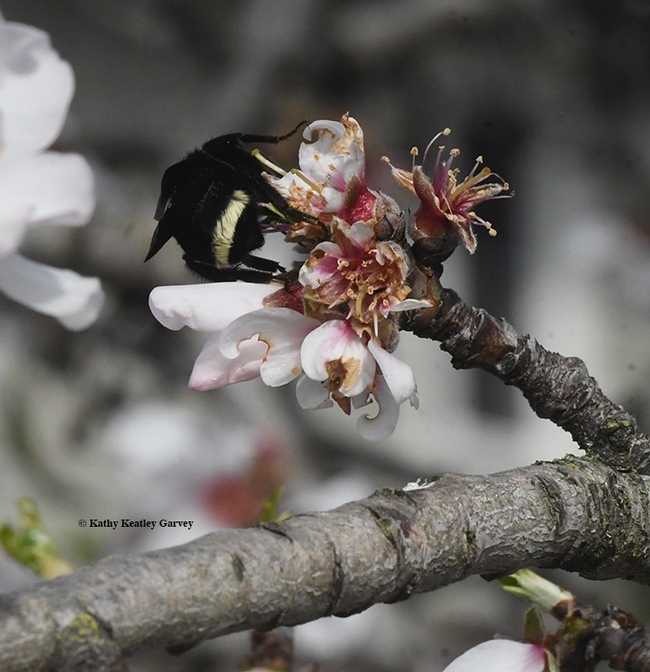 Sunday morning as the temperatures soared to 62 degrees in the Matthew Turner Park, Benicia, near the Carquinez Straits, bumble bees competed with honey bees for a share of the golden nectar on the blossoming almond trees. 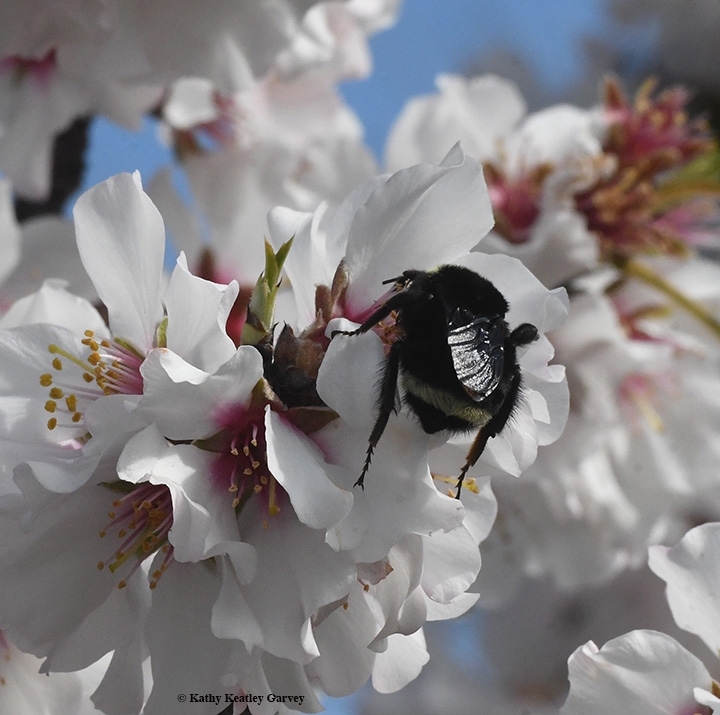 We witnessed near collisions as lumbering bumble bees lugged incredibly heavy loads while their more streamlined cousins, the honey bees, darted, ducked and dipped to avoid them. Definitely a need for air traffic controllers! "Bumble bee, bumble bee, cleared for take-off." "Honey bee, honey bee, stand by." "Bumble bee, bumble bee, permission to land." "Honey bee, honey bee, exit runway." "Bumble bee, bumble bee, line up and wait." "Honey bee, honey bee, cleared for take-off." 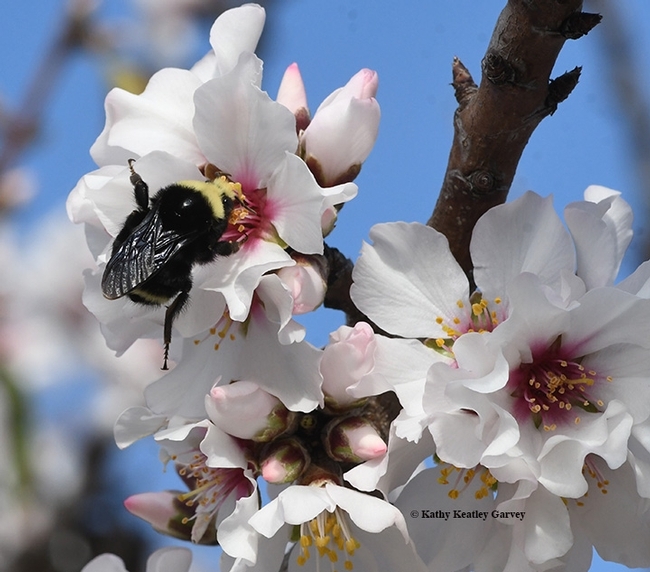 What a sight to see and what a beauty of a day to see bumble bees in Benicia. 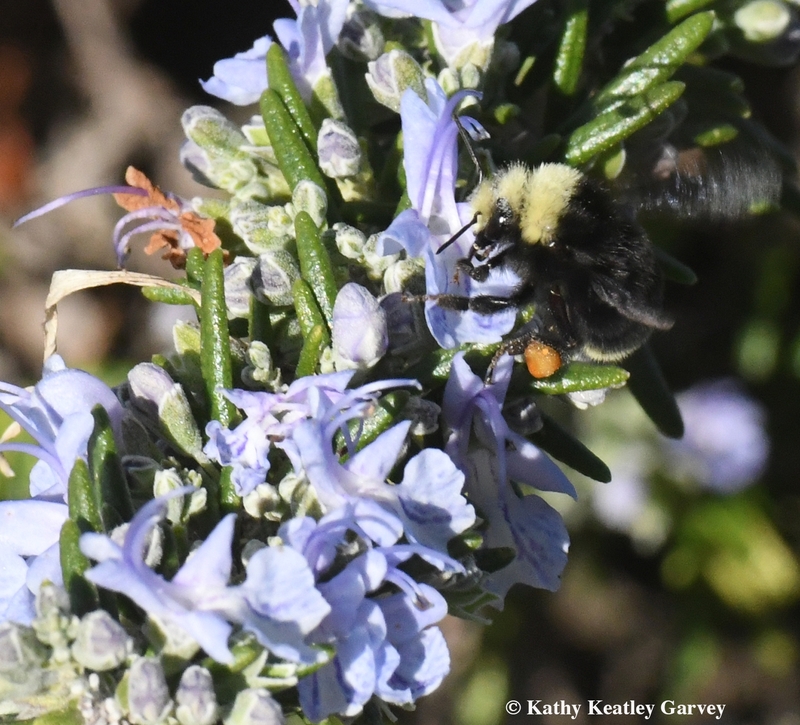 In yesterday's Bug Squad blog, we mentioned the unusual first-of-the-year bumble bee sightings at the Benicia Capitol State Historic Park. 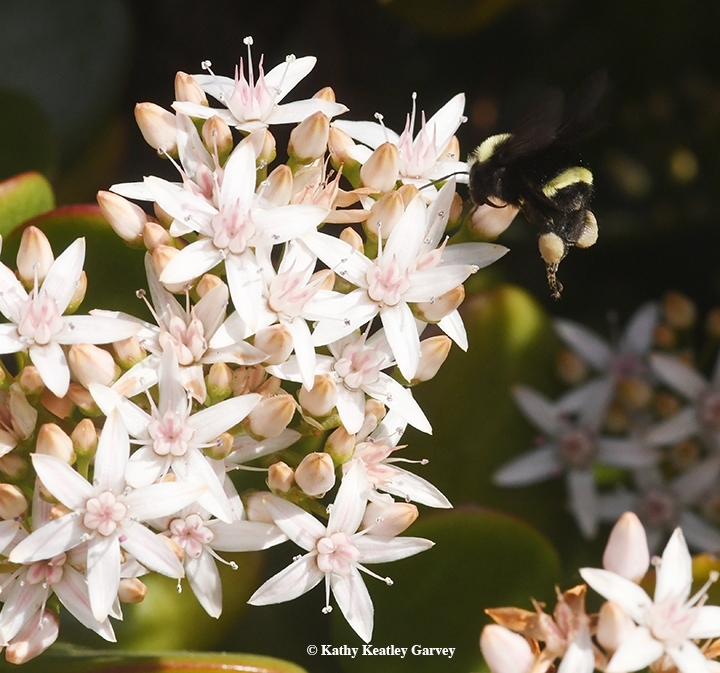 We captured images of the yellow-faced bumble bees, Bombus vosnesenskii, nectaring on jade, Crassula ovata, the morning of Jan. 1, 2018. They were packing cream-colored pollen. Bombus vosnesenskii were also out and about at the Benicia Marina--same morning, same day--but on a different floral species: rosemary, Rosmarinus officinalis. 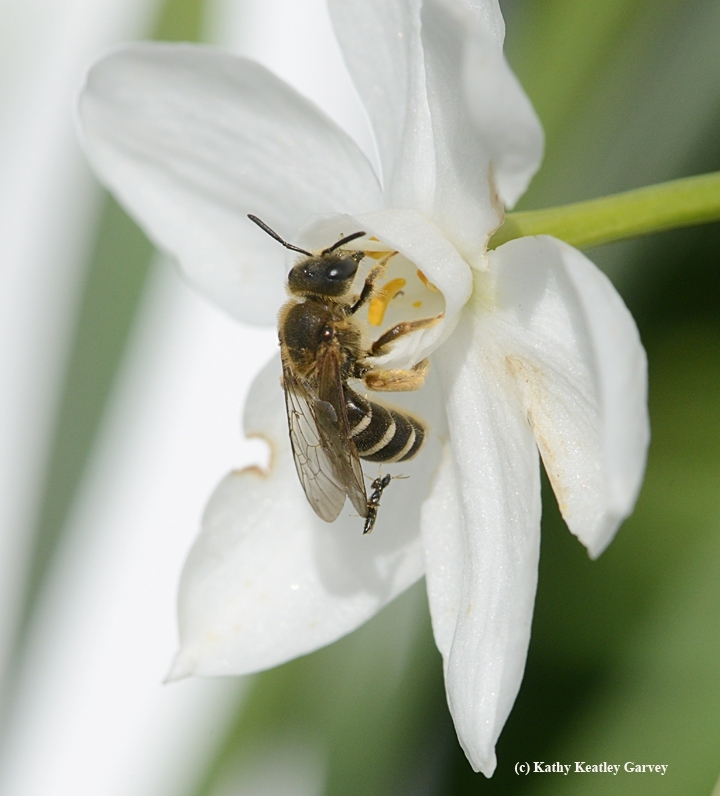 This flower, too, yields a cream-colored pollen. But wait! The bumble bees we saw foraging on the rosemary were packing orange pollen, as bright as Halloween pumpkins. What happened? They didn't get it from the rosemary. It came from another plant, perhaps the early blooming California golden poppies which yield orange pollen (and no nectar). Rosemary, which blooms nearly year-around in this area, belongs to the mint family, Lamiaceae, which also includes peppermint, spearmint, basil, lavender, marjoram, germander, thyme, savory, and horehound. One of the distinguishing features in this family: square stems. When you think about it, rosemary's presence at the marina is quite appropriate. It derives its name from the Latin "dew" (ros) and "sea" (marinus), or "dew of the sea." 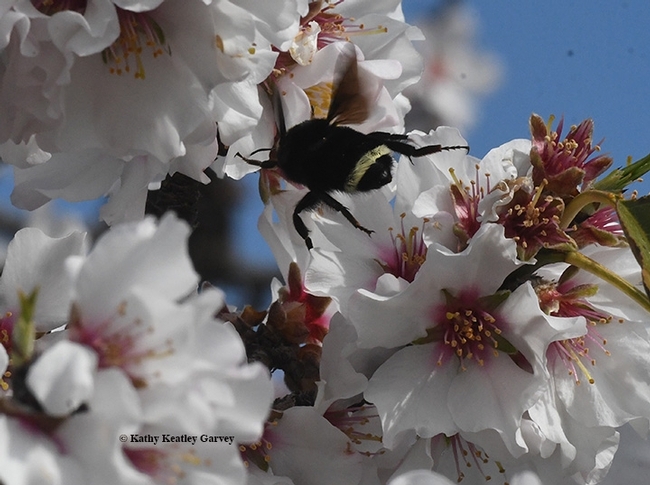 While folks from Alaska to Colorado to New York to Maine are shivering in freezing temperatures, here in sunny California--well, at least parts of the Golden State are sunny--bumble bees are foraging on winter blooms. Bumble bees? On the first day of the year? Yes. 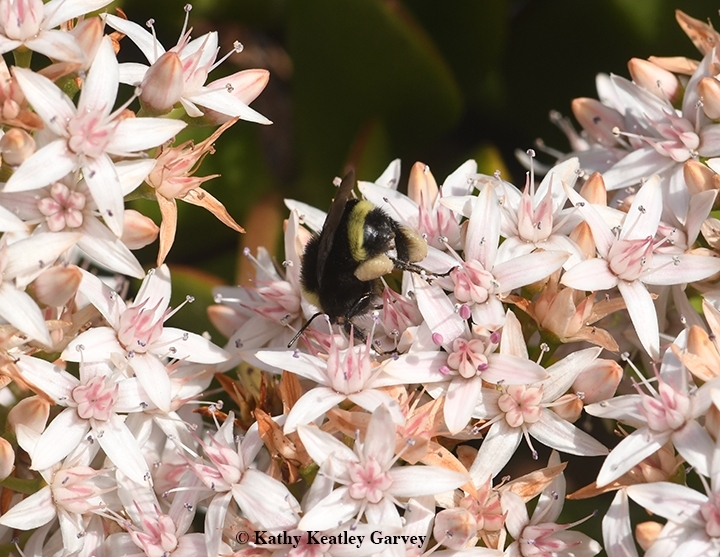 We spotted a dozen yellow-faced bumble bees, Bombus vosnesenskii, nectaring this morning in Benicia, Solano County, Calif. 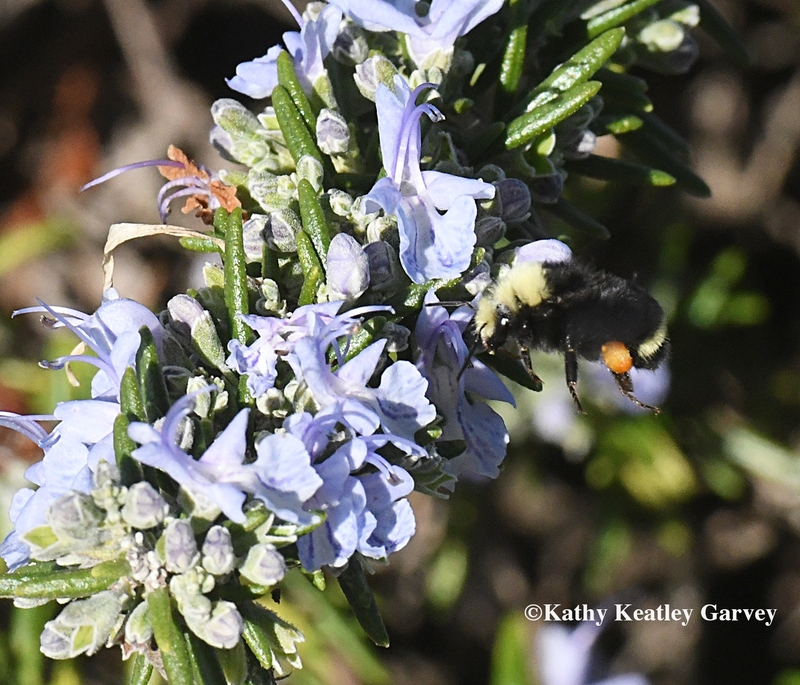 They were foraging on jade at the Benicia Capitol State Historic Park and on rosemary at the Benicia Marina. Honey bees and syrphid flies joined them. We also saw some hungry predators--birds--chasing them. For the last several years, several of us bumble bee aficionados--led by Robbin Thorp, distinguished emeritus professor of entomology at the University of California, Davis--seek to find and photograph the first bumble bee of the year. Last year the big winner was naturalist and insect photographer Allan Jones of Davis. 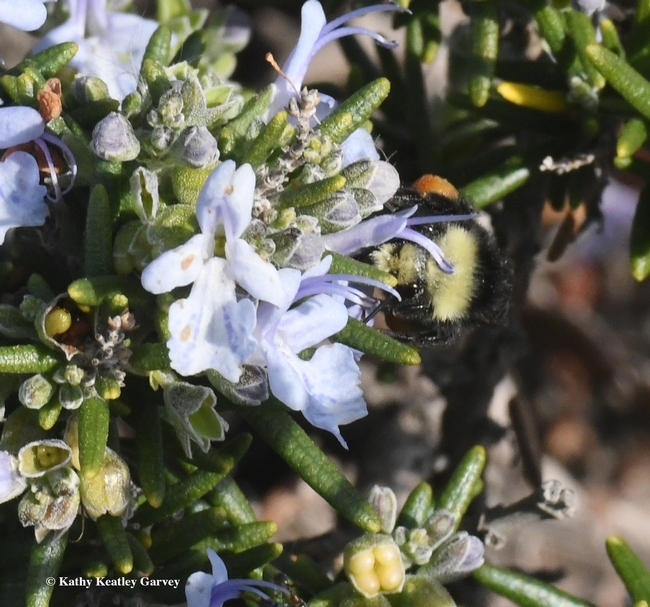 At 2:02 p.m., on Friday, Jan. 27, he alerted us: "Two Bombus melanopygus on manzanita just east of the redwood grove (UC Davis Arboretum)." And then he found another melanopygus. It was a three-in-one day. 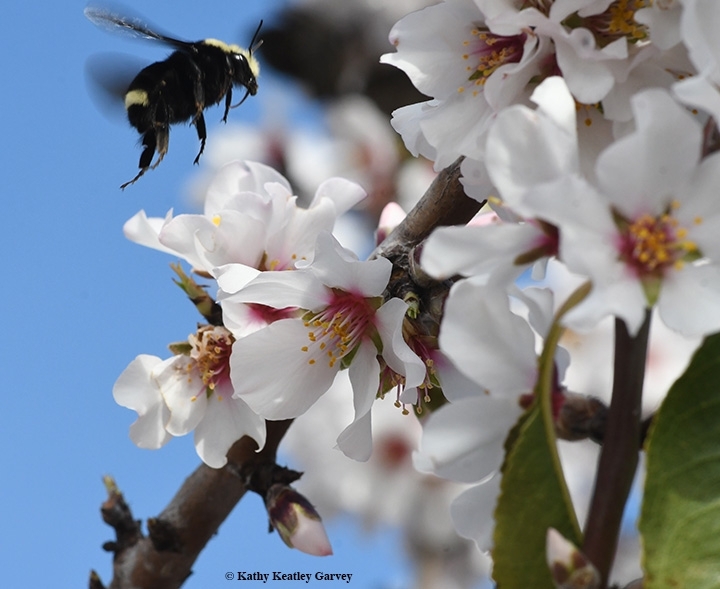 The story behind the story: Inspired by Robbin Thorp, a small group of eager bumble bee aficionados--naturalists and insect photographers Gary Zamzow and Allan Jones of Davis, and yours truly of UC Davis--launched the First-Bumble-Bee-of-the-Year Contest six years ago. It's a take-off of Art Shapiro's "Beer for a Butterfly" contest. Shapiro, a distinguished professor of evolution and ecology at UC Davis, offers a pitcher of beer for the first cabbage white butterfly (Pierae rapae) of the year found in the three-county area of Sacramento, Yolo and Sacramento. He launched the contest in 1972 as part of his long-term studies of butterfly life cycles and climate. For us bumble bee aficionados, the prize isn't a pitcher of beer. There's no prize. It's basically to provide a few more eyes to help Robbin Thorp track early-season bumble bees. 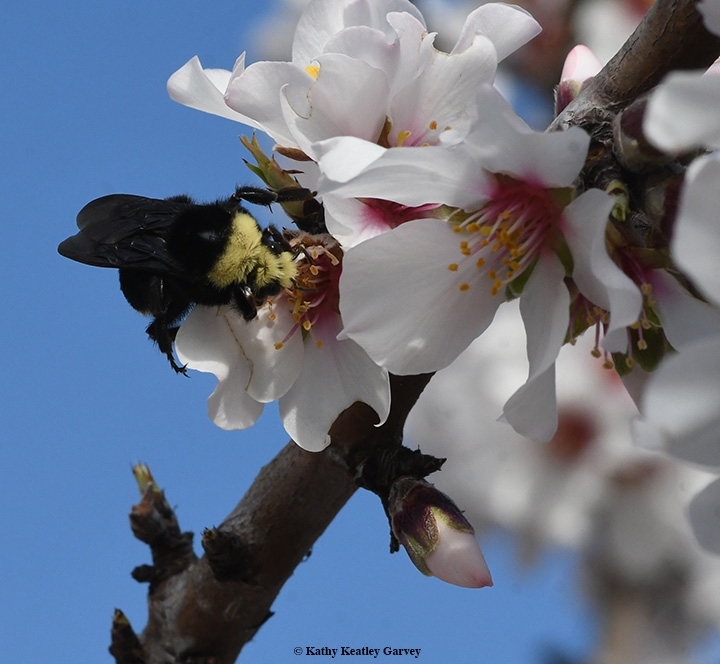 Thorp is the co-author of Bumble Bees of North America: An Identification Guide (Princeton University Press) and California Bees and Blooms: A Guide for Gardeners and Naturalists (Heyday). Meanwhile, look around for bumble bees in your area. You won't find them in the "deep freeze" states like Alaska, North Dakota or Minnesota. And you certainly won't find them in Hettinger, N.D., where the temperature dipped to a negative 45 degrees today. But if you're in Benicia or another sunny place, it's a Bumble Bee Kind of Day and what a way to begin the New Year! Honey bees aren't the only bees out foraging. 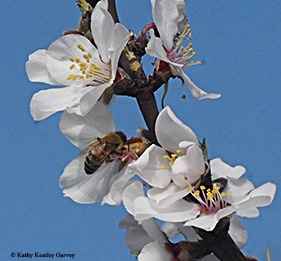 We saw our first native bee of the season on Jan. 25 at the Benicia Capitol State Historic Park. 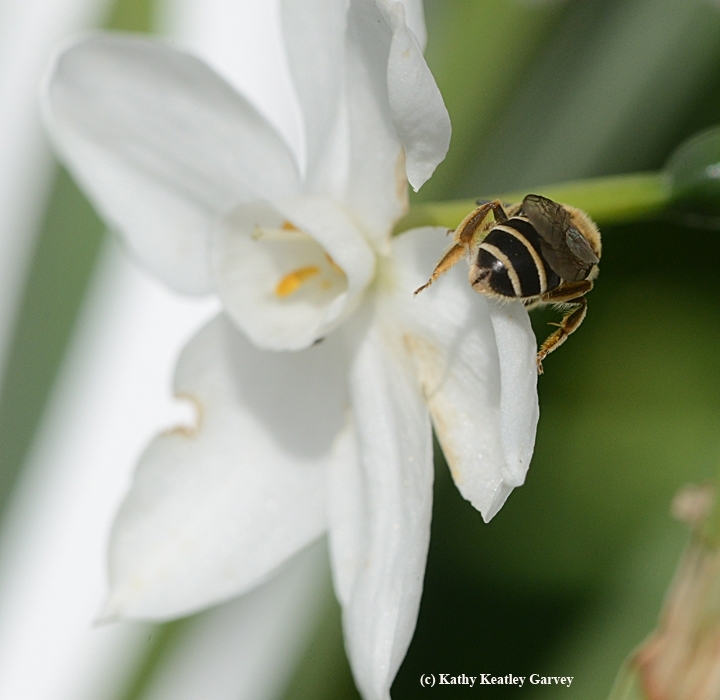 Native pollinator specialist Robbin Thorp, distinguished emeritus professor of entomology at the UC Davis Department of Entomology and Nematology, identified it as a female sweat bee, Halictus rubicundus. "The head shape, lack of long curled hairs below at the base of the hind leg, and the bent basal vein in the wing" helped him identify it as a Halictus. The lack of facial foveae confirmed it was not an Andrena. 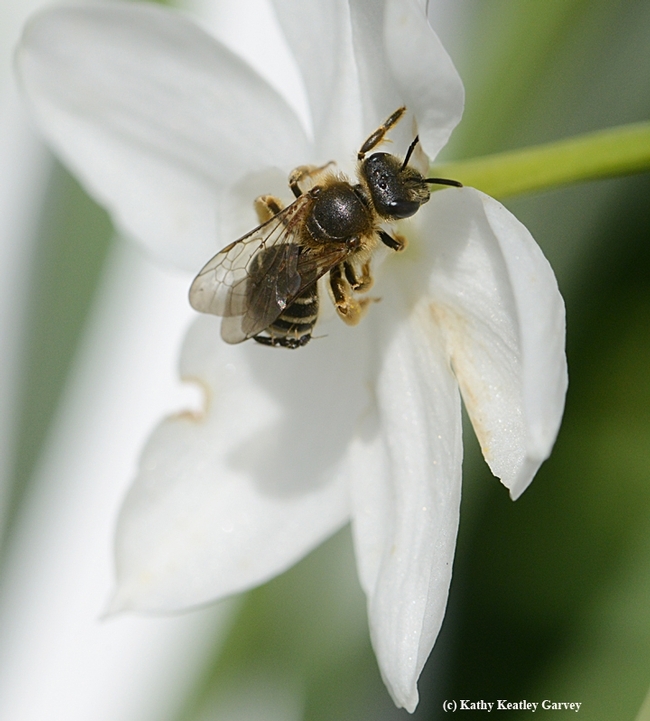 Halicutus rubicundus is found in Europe, northern Asia, and across the United States and Canada, according to the book, The Bees in Your Backyard, A Guide to North America's Bees, by Joseph S. Wilson, assistant professor of biology at Utah State University, and Olivia J. Messinger Carril, who received her doctorate in plant biology from Southern Illinois University and "has been studying bees and wasps for more than a decade," according to the publisher, Princeton University Press. You can see more images of this sweat bee on BugGuide.Net. So, one sweat bee down. Hundreds more to go as the seasons unfold. This damselfly (below) is so camouflaged that it's difficult to see her. Her? 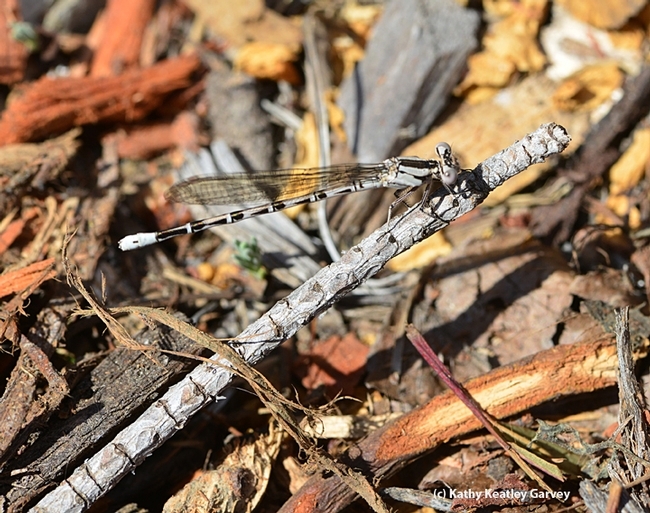 She's a female Argia vivida, as identified by Lynn Kimsey, director of the Bohart Museum of Entomology and professor of entomology at UC Davis; and dragonfly/damselfly/butterfly aficionado Greg Kareofelas, a volunteer at the Bohart Museum. The males are a bright blue. We didn't see both genders, though, when we were looking for damselflies in a bed of Spanish lavender last weekend in Benicia. Argia "is a genus of damselflies of the family Coenagrionidae and of the subfamily Argiinae," according to Wikipedia. "It is a diverse genus which contains about 114 species and many more to be described. It is also the largest genus in Argiinae. They are found in the Western Hemisphere." Like their cousins, the dragonflies, they're predators that eat other insects. Argia vivida are known as "dancers" because of "the distinctive jerky form of flight they use which contrasts with the straightforward direct flight of bluets, forktails and other pond damselflies," according to Wikipedia. "They are usually to be seen in the open where they catch flying insects on the wing rather than flying about among vegetation picking off sedentary prey items. They tend to land and perch flat on the ground, logs and rocks. When perched, they usually hold their wing slightly raised above the abdomen." That's what this one was doing.